The Kushan Empire was a syncretic empire, formed by Yuezhi, in the Bactrian territories in the early 1st century. 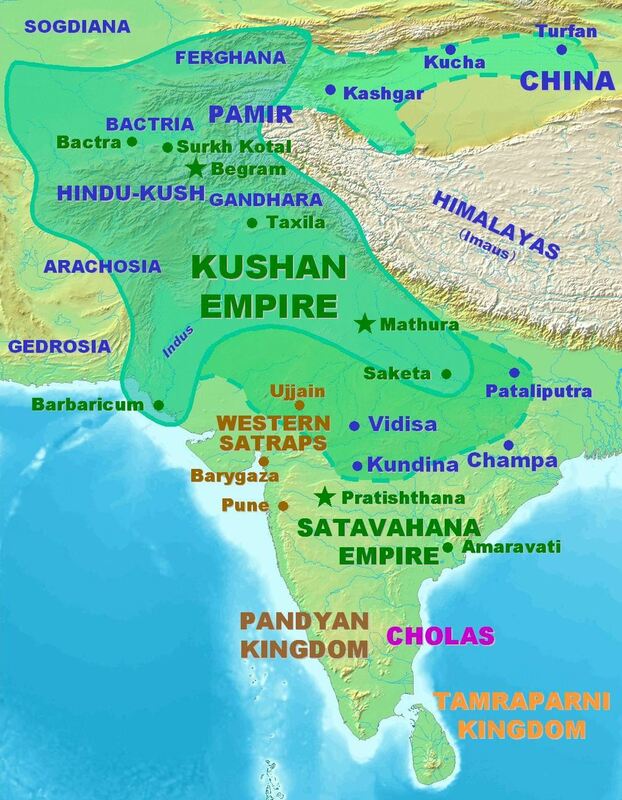 It spread to encompass much of Afghanistan, present-day Pakistan, and then the northern parts of India at least as far as Saketa and Sarnath near Varanasi (Benares), where inscriptions have been found dating to the era of the Kushan emperor Kanishka the Great. The Kushan empire fragmented into semi-independent kingdoms in the 3rd century AD, which fell to the Sasanians invading from the west. The main coins issued were gold, weighing 7.9g., and base metal issues of various weights between 12g and 1.5g. Little silver coinage was issued, but in later periods the gold used was debased with silver.